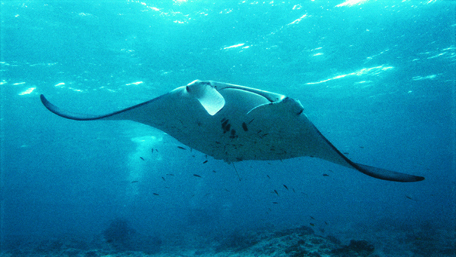 It is in the hot waters of the Indian Ocean, specifically in the Maldives archipelago, that we encountered the giant of the rays family, the ray manta. Sailing over the water on our boat under a blazing sun, scanning the horizon for more than an hour in search of rays, we suddenly spot a bench of these huge fish that arose and disappeared in the sea of the Maldives. We dive immediately despite poor visibility due to the excessive presence of plankton. Just lying on the ground, three meters deep, we are surprised by the first ray, with impressive body, which appears behind my partner before making a sudden U-turn. It does not take much to our joy, to be followed by a procession of ten others, as huge. They drew quietly in water huge circles, then suddenly changed their trajectory. Sometimes couples left the group to go make their maneuvers away from others. We saw a couple rise at the same time, face to face and then split each in a different direction to get a few minutes later, ready for another act. Beautiful these rays making the ball gently flapping their fins in a show of the most fascinating, not for the pleasure of the exhibition but in search of plankton, its almost unique food. Amazing water show, it looks like a real choreography in an amphitheater. 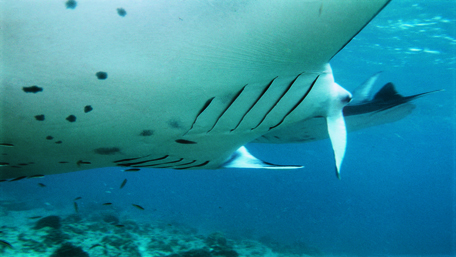 Both visible horns of the manta ray. They serve to channel to its mouth microscopic food. Very friendly, manta ray approach divers and lets us take a picture of it. 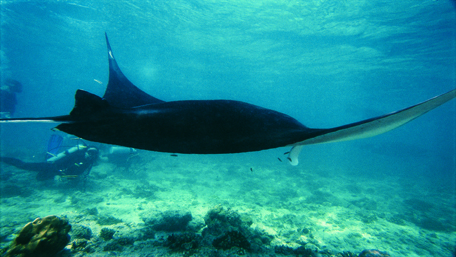 Huge cartilaginous fish with flattened body, manta rays can reach seven or eight meters and a weight of one to three tons! Its gill slits are on the belly and are not visible unless the animal is in the reverse position. The manta is a friend of the man that it doesn’t attack only in case of defense with a poisonous whip at the tip of the tail. Unlike other rays, it rarely arises on the seabed, it is sometimes seen swimming on the surface and perform, despite its weight, leaps over five meters, presumably to get rid of parasites stuck under its belly. This fish can undertake long journeys in warm and temperate seas, including the Mediterranean. Sting rays live in groups. It is rare to see a ray swim alone. The female is ovoviviparous, the eggs hatch inside its body, it gives birth to only one offspring per litter, which can reach 2 meters and weigh10 kilograms. 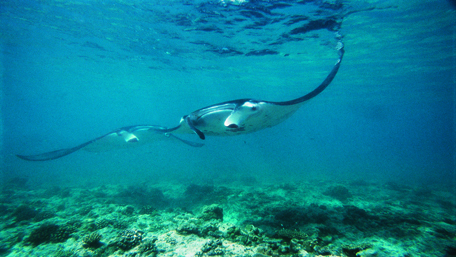 The ray, despite its enormous size, feeds only on plankton and tiny fish. It uses its horns slightly curved to channel towards its mouth microscopic food by performing in the waters trips like dances to go in search of this plankton. After having feasted, it digests slowly by floating such a huge sailboat on sunny waters of the ocean. The ray has teeth on its lower jaw, not for food, far from it, but to hold on to its partner during mating. 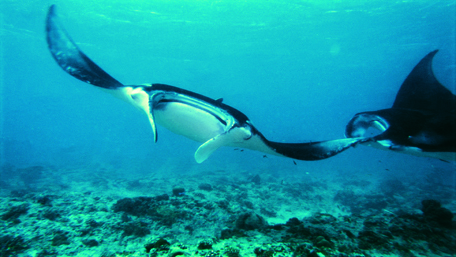 The esophagus of the ray is significantly small compared to its body, which allows the stomach to receive only small preys. Water and food are fed at the same time, the gill filters have the task of sorting. Why do we call it the devil of the seas? 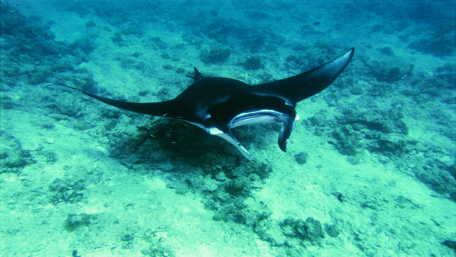 The two small horns planted at the front of its head that gave the nickname of “sea devil” to the ray manta, although this is not the only reason. Legend has its own history. Sailors have long believed that it could lead the boats deep in water, it prevented researchers of pearls to rise to the surface by spreading over them. 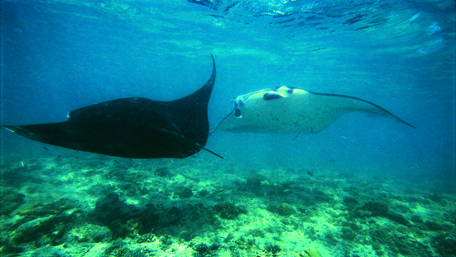 What time of the year can we see mantas in the Maldives? 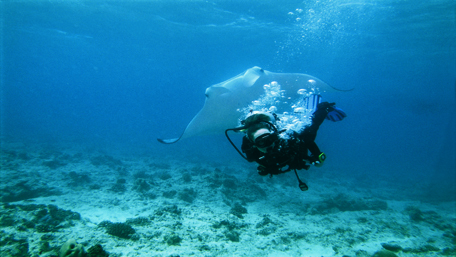 In fact, one can encounter the manta rays during two distinct seasons in the Maldives islands. North East between December and April, a period that corresponds to summer in this region of the Indian Ocean, and between May and December in the South West where temperature again becomes lenient. We can even see them swim quietly on the water surface.